With Quantum Class, Royal Caribbean has brought a revolution to sea. Now you can skydive right onboard, in the RipCord by iFLY® simulator. Step into the North StarSM observation capsule to ascend 300 feet above sea level for 360° views. And watch whole rooms change right before your eyes. Like SeaplexSM, where bumper cars and trapeze school invite you to play, and Two70, which features brilliant ocean views by day and spectacular high-tech entertainment at night. COME SEEK! Royal Caribbean has set the standard for the cruising industry for many years and you owe it to yourself to answer their call. Royal Caribbean Cruise Line's fleet of 25 ships has something to offer for every type of cruiser and they do it with innovation and style. 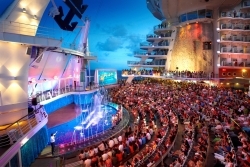 Royal Caribbean Cruises was the first cruise line to turn the ship into a destination. With the advent of the Voyager class ships, the Voyager of the Seas, the Navigator of the Seas, the Adventure of the Seas, the Explorer of the Seas and the Mariner of the Seas, RCCL introduced a line up of innovations that wowed their cruising guests. For the first time ever, you could climb a rock wall 2000 feet above the sea, skate on the first ever ice skating rink at sea, or stroll through the spacious main street style Promenade packed with designer shopping opportunities. Rest up and sip a pint in the British Style Pub after you shop til you drop! Accommodations, as always, are well thought out and offer all the creature comforts you can imagine. Whether you choose a cozy inside suite or a huge luxury suite with a baby grand piano, you will not be disappointed. Dining options abound, with the beautiful Main Dining Room offering breakfast, lunch and dinner in stylish splendor. Alternative dining will temp your palate in the Jade Sushi or the Portofino Italian style restaurant. Let's not forget the casual dining opportunities at Johnny Rockets or Ben and Jerry's Ice Cream. You are never at a loss for something to do, or see, or experience. If all of this activity is not your style, relax and unwind in the Vitality Spa, with 100+ treatments to choose from or just say Ahhhh! In the luxurious heated thermal suite. 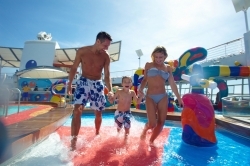 The Freedom class of ships, The Freedom of the Seas, the Liberty of the Seas, and the Independence of the Seas continued on Royal Caribbean's innovations by giving you even more exciting options. Here you can hang ten on the FlowRider, ice skate, rock climb or play in the H2Ozone water park. All this at sea?! Another must do is relax in the whirlpools that extend 12 feet beyond the sides of the ship. You didn't know you could be a mermaid, did you? Just when you thought that this is the epitomy of cruising, Royal Caribbean brought out their next brain child of innovation. The exciting Oasis class of ships. The Oasis of the Seas, and the Allure of the Seas. Both ships feature seven incredible neighborhoods to explore, and each is packed with first-at-sea adventures. Now you can choose to walk the Royal Promenade or stroll through the delightful Central Park outdoor garden with it's many shops galleries and restaurants. Everyone loves a classic carousel and a trip to the Boardwalk would not be complete without a ride on the beautiful hand carved carousel. The ships are so well designed that you never feel lost in a crowd. 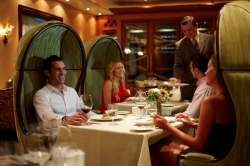 Dining is once again classic Royal Caribbean with delicious complementary multi course breakfast, lunch and dinner. Should you have a taste for something different over 14 other venues await to tempt your palate. 150 Central Park, Chops Grille, and Giovanni's Table are just a few of the culinary temptations to choose from. With all that Royal Caribbean Cruises has to offer it's no wonder that they have been a top choice for the savy cruiser. Isn't it time for you to answer the call of the sea!